Would your partner rather go out with their phone than you? 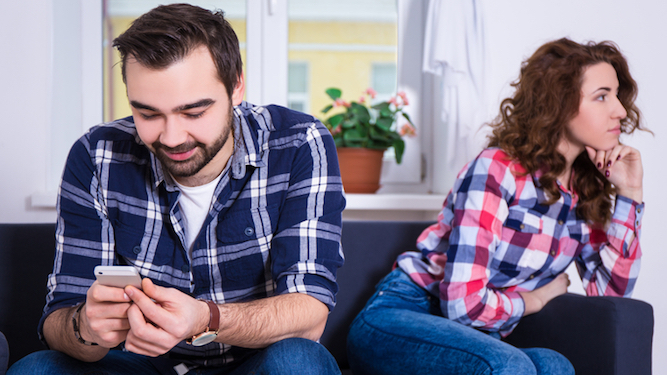 EVERYONE loves their smartphone, but are you concerned your partner would rather have a relationship with it than you? Take our quiz and find out. B) Spend the entire time looking at reviews on Rotten Tomatoes, tweeting about it and googling members of the cast they’ve “seen in something else”, then act as if it’s a massive achievement to identify Amy Adams. A) Give you a cheeky wink and ask whether you fancy an ‘early night’. How does your partner spend their evenings? A) Talking to you about what to watch on Netflix, how your day has been and perhaps joking about whose turn it is to take the bins out. B) Having long ‘conversations’ with people they don’t know on other people’s Facebook pages and watching YouTube videos of skateboarding animals with an expression of utter devotion on their face. A) Listen intently to your opinion on the chicken jalfrezi. B) Spend the entire evening in a state of agitation because they are desperately trying NOT to check their notifications. When you go to the toilet they furtively update their social media to proudly tell everyone they’re having a phone-free evening. Your partner gets a promotion. What do they do? A) Call you straight away to share the news. B) Post it on Facebook, LinkedIn and Instagram, Snapchat their mates about it and set up a WhatsApp group called ‘I GOT A PROMOTION’, then casually tell you about it the next day. Mostly As: Good news – your partner loves you more than their phone. Discourage them from getting a snazzy new one just in case. Mostly Bs: You are facing stiff competition from your partner’s phone. Try showing them amusing pictures of cats, listing 16 things you can do with an avocado and making beeping noises to get their attention. A YOUNG driver has spent every night for well over two years driving around aimlessly in his crappy car. Apprentice electrician Wayne Hayes spends a phenomenal amount of time on the confusing ritual which appears not to involve socialising, impressing girls or even particularly fast driving. Hayes’ mum Sandra said: “I was worried he was getting into dangerous races but he just seems to drive around for hours, like a taxi driver but without getting paid or meeting new people. “He even went out for a drive on Christmas Eve. Was he hoping to impress Santa? I reckon a magical flying sleigh could easily burn off Wayne’s knackered Citroen Saxo. Hayes said: “It definitely isn’t pointless. I could easily find myself sucked into a Fast & Furious scenario where my driving skills are needed on an important adventure.